Here is everything you need to know about diagramming verbals. Be sure to check out the Sentence Diagramming Reference Manual which includes even more awesome information than you'll find on this page. Gerunds are formed from verbs, but they act as nouns. They end in -ing. Learn more about diagramming gerunds. Diagram them on steps with the -ing part on the bottom of the step. Connect the step to the rest of the sentence diagram with a forked line. Gerunds can take complements and modifiers. When they do, all of the words work together as a gerund phrase. Here is a gerund phrase that contains a subject and a direct object. 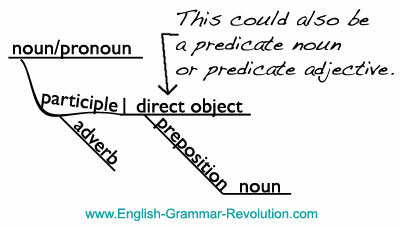 Here is how you would diagram a gerund phrase that contains a predicate noun or a predicate adjective. Learn More About Gerunds and Gerund Phrases. Infinitives are formed from verbs, but they act as nouns, adjectives, or adverbs. They consist of the word to plus a verb. 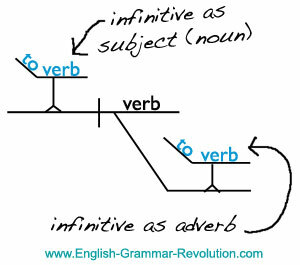 Learn more about diagramming infinitives. Diagram the to part of the infinitive on a slanted line. 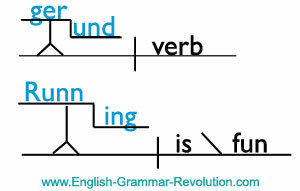 Diagram the verb part of the infinitive on a horizontal line after it. Connect it to the rest of the sentence diagram with a forked line. Infinitives can take complements and modifiers. When they do, all of the words work together to form an infinitive phrase. Participles are formed from verbs, but they act as adjectives. 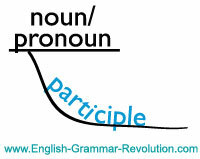 Diagram them on curved, slanted lines below the noun or pronoun that they modify. Learn more about diagramming participles. I have all your materials, and I think it's all superb. It is a great way to make grammar tuition more dynamic/interactive and less didactic. It also appeals to visual learners.